Thank you for your interest in our Villa!!! We would be thrilled to host you at your home-away-from-home in Tuscany, whether you are celebrating a special anniversary or birthday, gathering with your family and friends, a wedding, honeymoon or a much needed vacation! We strive to help you create a special experience no matter what the occasion, providing you with expert advice that can only be provided by locals, beginning before you even arrive and throughout your entire stay. Just relax....your vacation in Tuscany begins now!!! 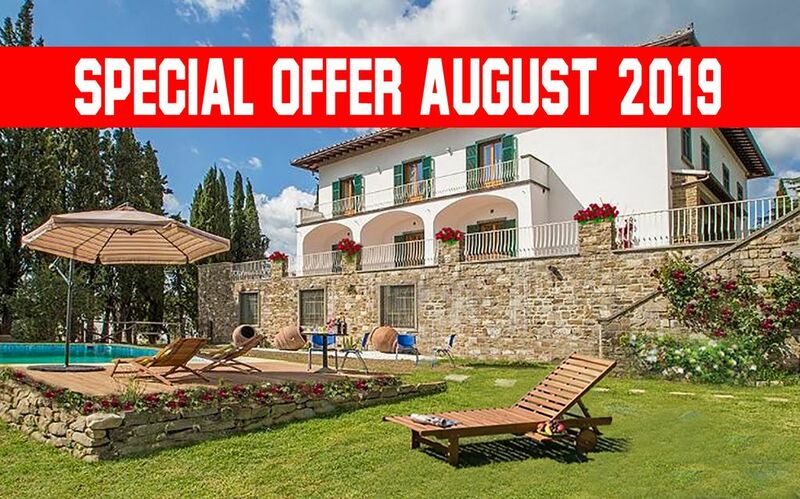 The Villa is located near Chiesanuova, a small village in Chianti set on a rolling hill between vineyards and olive trees. Its location in the heart of the world famous Tuscan countryside just 14 km from the enchanting Renaissance city of Florence allows you to experience the best of Italy. On the second floor there are 8 large bedrooms, each complete with a private bathroom recently renovated in 2015. Do you need more bedrooms? No problem we can put at your disposal 1 more bedroom(with a little extra cost). The tower can be accessed by climbing a flight of stairs, and once at the top you can enjoy a stunning 360-degree view of the surrounding countryside. The Villa is emersed in the green rolling hills and countryside that can only be found in Tuscany, offering a perfect oasis of tranquility and privacy. The splendid Villa is at the center of a beautiful garden full of comfort zones . There is a large terrace which is also a real theater opened on the spectacle of nature, ideal for alfresco lunches/dinners, enjoying the wonderful view and the tranquillity of the place. If you want to get the best feel for what our Villa offers and how we take care of our guests I'd suggest reading our reviews. (if you have not already done so). We believe our guests can tell the story far better than we can! Our goal is that our guests leave saying “Wow, that was a fantastic experience!" and we’ll bend over backwards to ensure you do! - DAY TOUR WITH PRIVATE TRANSPORT TO STUNNING ITALIAN CITIES SUCH AS PISA, LUCCA, CINQUE TERRE, MONTALCINO, AND MONTEPULCIANO, JUST TO NAME A FEW! HI! I'm a mom mostly! my family is at the top of my charts! I chose this job because I love to know people and cultures from different countries and develop with them a relationship of friendship. I love working outdoors, I love the flowers and all I can do with hands! Looking forward to host you! The Villa is located 1 km from Chiesanuova, a hamlet of San Casciano Val di Pesa, in the heart of Chianti Fiorentino. This area is known worldwide for the prestigious wine, for its evocative sceneries and charming villages, from Greve in Chianti to Castellina in Chianti , from Radda to Gaiole. Thanks to the proximity to A1 highway (the exit “Firenze-Impruneta” is 7 km away), and the highway Firenze-Siena (the exit “Impruneta-Greve in Chianti” is only 4 km away), the property is the ideal starting point for exploring the beautiful Tuscan sights, primarily Florence (whose historic centre is just 13 km), then the wonderful Siena up to the several medieval villages of Tuscany (like San Gimignano, Certaldo, Volterra, Monteriggioni). MAIN DISTANCES San Casciano Val di Pesa (6 km), Florence city centre (13 km), Greve in Chianti (25 km), San Gimignano (44 km), Siena (63 km), Pisa (76 km), Arezzo (79 km), Lucca (88 km). We had an incredible experience. We had 12 people in March and the hospitality and knowledge of our hosts made the time far better than it would have been otherwise. Beatrice and Jacopo answered all my questions before the trip within 12 hours -- and using Whatsapp during the trip they replied within minutes. They had superb suggestions for meals and made reservations for us. They are acquainted with an excellent tour guide who tailored her talk to our group and desires - which makes sense - but she did it with style and still worked in fascinating history and culture. The house has bathrooms in every bedroom and all amenities are provided. The wifi and washer dryer worked and everything was spotless. We had an excellent welcome meal and the cooking class was awesome!! This may not sound like a big deal to some, but we made our own pasta - for the students that was a first for most - and for me. Very cool. This villa met the requirements for our family very well. The basics were easy to take for granted. Clean, well equipped, as advertised. Wifi worked; hot water never ran out. Nice pool. Plenty of parking and shade. Air con effective and anti-insect devices kept it comfortable indoors in the hot August sun. All the bedrooms were a good size and had well equipped ensuite bathrooms. The tower was fun to watch the sun go down or get from it all during the day. Some of the family used the generally reliable bus services. But cars are needed to get the most out of the villa's rural but not at all isolated position. It's easy to get into Florence. Beatrice and Jacopo are good hosts, making us two family meals. The internet photos of this property do not do it justice. The property is really lovely. lots of space for everyone both inside and outside. It is equipped with everything you could want for a family holiday. Beatrice and Jacopo are excellent hosts arranging restaurant bookings, wine tours and grocery shopping for us. They also organised a cookery class for us. The plan was that the children made pizza and the adults would make fresh pasta, bruschetta and tiramisu. However the children took over and loved every minute. Anyone who can keep 4 kids aged between 7 and 11 totally engaged for 3 hours is obviously doing something right. It is very well placed to reach the motorway making touring the area very easy. We had a group of 13 stay here - 7 adults and 6 kids between the ages of 2-11. It was perfect! The house is gorgeous inside and out. Every bedroom had its own bathroom which was fantastic. The beds were comfortable and the a/c was great during the hot summer evenings! The pool was excellent, especially with kids! Beatrice and Jacoba were extremely gracious and helpful. They set up a shuttle to and from the Florence train station for us which worked out great. It is helpful to have a car however as the streets are narrow and not friendly for walking about. There are many good restaurants in the surrounding area and any number of great day trips. Our family LOVED San Gimignano-well worth the 45 minute drive! We would love to come back!! Gathered around the table on the outdoor terrace, family gathered together to celebrate family - a group of twelve couldn’t have found a more special place than this villa. The villa sits high and we enjoyed peace, quiet, beautiful views and sunsets. It is a spacious villa, beautifully decorated, marble staircases, two huge dining areas, eight bedrooms each with it’s own bathroom (what a find!!! ), well equipped kitchen - this vacation rental has it all. Beatrice and Jacopo were amazing from the early booking, the many emails I sent with so many questions - the quick response and information was much appreciated. We had 2 dinnersat the villa and they were amazing - thank you so much Beatrice and Jacopo - great memories were made here! Location, location, location - easy access to Florence, Pisa, Lucca, Volterra, restaurants (all amazing) , markets, bakeries. I cannot say enough about this villa and I have booked many places over the last 14 years in many different countries - I think I have to say this is my #1 !!!!!!! Our family has experienced many vacation homes in the past. This experience topped them all!